I recently experienced a situation where Android Studio’s emulator crashed when starting an app that performed basic graphics operations. 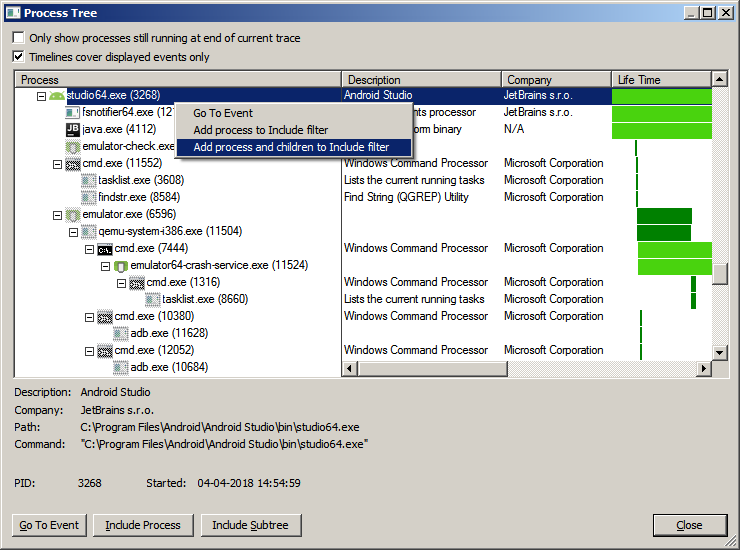 I started up Process Monitor to investigate the issue. This indicated that the problem was related to graphics drivers and/or settings. I did not have important data on the Android emulator, so I made it boot again by removing all data (including the auto-starting app, which crashed the emulator). Did this in Android Virtual Device manager with the Wipe Data option. When the emulator could start again I started looking for additional graphics settings. Found some under Extended controls -> Settings section -> Advanced tab. 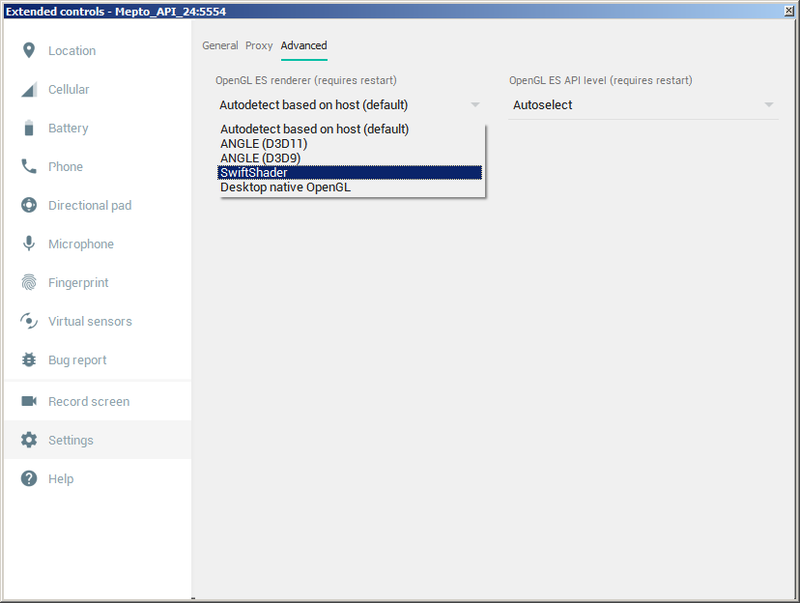 The default setting for OpenGL ES renderer (Autodetect based on host) seemed problematic on this system. I experimented with the settings and discovered that SwiftShader worked well. Running graphics rendering apps with this setting no longer crashed the emulator. The problem occurred on a desktop system with an Intel Skylake CPU (Core i7-6700) running Windows 7 using Intel HD Graphics 530 with driver version 21.20.16.4860. 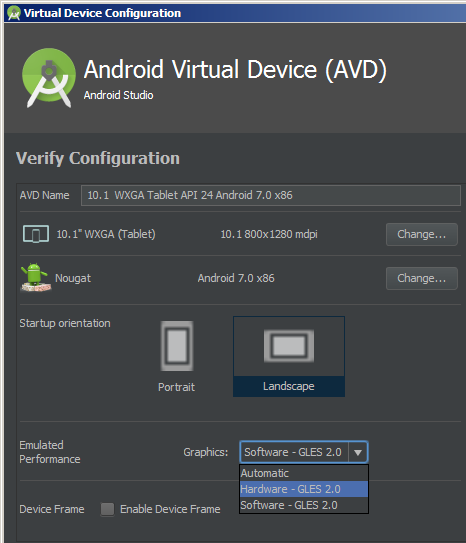 If Android Studio’s emulator crashes when running graphics rendering apps, it may help changing the OpenGL ES renderer setting. 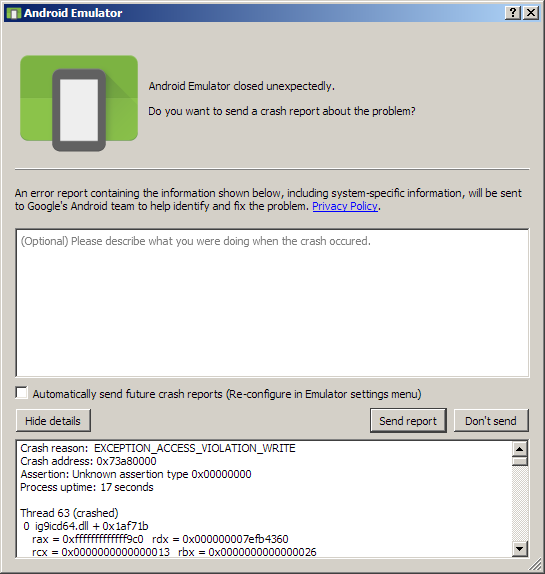 I recently experienced a situation where Android Studio’s x86 emulator would not start. It just showed a black screen with no apparent progress. 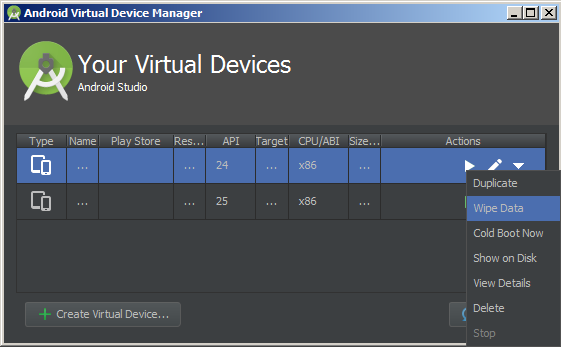 To investigate I connected Android Device Monitor to the emulator. LogCat showed a lot of messages and they seemed to repeat over and over. I decided to pause the emulator to examine the log. D/libEGL(17248): Emulator has vendor provided software renderer, qemu.gles is set to 2. D/gralloc_ranchu(17248): Emulator without host-side GPU emulation detected. E/gralloc_ranchu(17248): Could not find software fallback module!? E/gralloc_ranchu(17248): Failed to connect to host (QemuPipeStream)!!! Decided to check the emulator configuration. Noticed that the emulator was configured to use software graphics. Changed this to hardware graphics, started the emulator again and noticed that it started normally. The workaround solved the problem. If the Android Studio emulator hangs with a black screen, try checking the LogCat messages and try switching graphics mode. I recently experienced problems with Android Studio, where it would no longer clean or rebuild a particular project. Unfortunately this had no effect. However the Gradle output still didn’t explain clearly why the build process was failing. I closed the Android Studio project, moved the .gradle folder outside of the project folder and reopened the Android Studio project. It was now possible to clean and rebuild the project again. If Android Studio refuses to build due to NullPointerException from Gradle, try removing or moving the .gradle folder from the affected project.